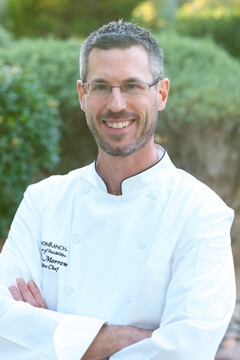 Justin Morrow is the Executive Chef at Canyon Ranch in Tucson, Arizona. Justin has been with Canyon Ranch for nearly 20 years. In addition to overseeing all 5 kitchens, a staff of 50+, and the preparation of up to 1,000 meals a day on property, he is involved in menu development and maintaining the standards of Canyon Ranch’s food philosophy. Chef Morrow received his culinary training at the prestigious Culinary Institute of America in New York where he graduated in 1995. Prior to joining Canyon Ranch Justin managed a kitchen in an Italian restaurant and cooked in a restaurant that was focused on a healthy, sustainable, vegetarian cuisine. Justin enjoys branching out and experimenting with varieties of cuisine, always opting for the freshest seasonal and artisanal products.